The gorgeous and very substantial Opera Grand Callas floorstander doesn't exactly come cheap, but given its no-compromise build and finish, it actually costs rather less than you might expect – especially when you consider it has a number of interesting and unusual features. It's the latest from Opera, a company that's associated with electronics specialist Unison Research; the two firms share premises on an industrial estate just outside Treviso in north-east Italy. The Grand Callas (£6,500 in the pictured luxury-gloss finish) might be a brand new model, but it has much in common with the rather unconventional second-generation Callas standmount we reviewed last year. Apart from the fact that the regular callas uses its solitary cone driver for bass as well as midrange, with further assistance from reflex-port loading, the midrange and top end of the two models are effectively identical, and also very different from the high-end speaker norm. Instead of just the usual single tweeter, there are no fewer than five tweeters in each speaker – two at the front and three at the rear. It's an arrangement that has a number of implications, especially in the way that high frequencies are distributed in the listening room, though pinning the consequent effects down precisely will be tricky. The Grand Callas is therefore essentially a floorstanding variation on the standmount Callas theme, with a built-in passive subwoofer. The very attractive full-height enclosure fills in the space that would otherwise be used for a stand with a sealed sub-enclosure, roughly 40 litres in capacity. This loads three matching 135mm drive units (apparently identical to each other as well as to the midrange driver), featuring 100mm-diameter magnesium-alloy cones around large (38mm), fixed solid-copper 'bullet' phase plugs. The enclosure sides are crafted in subtle curves, and built from very substantial MDF panels, variously 30mm, 40mm and 50mm thick. Careful internal front-baffle sculpting avoids blocking the rearward radiation from the cone drivers, while further shaping on the outside should assist lateral dispersion. Presentation is exceptional, in the very best Italian tradition. The curved sides are formed with veneer strips that simulate horizontal staves, while the top is a chamfered solid wood slab. The shaped front panel is elegantly trimmed in hide. furthermore, the floor-coupling arrangements are first class, with substantial steel 'wings' and hefty spikes, extending the lateral footprint and ensuring superb physical stability. The spikes here are brass with large domed tops, which not only look a bit classy, but are also highly visible – helpful in avoiding stubbed toes! Two pairs of notably substantial terminal pairs provide a bi-wiring or bi-amping option, but are linked by brass strips when delivered. The SEAS-sourced bass and midrange drivers have advanced excel motors, with copper rings above a T-shaped pole piece to minimise distortion. High power handling is assured via 38mm aluminium-former voice coils, with a 14mm peak-to-peak excursion capability, and the solid-copper pole extension aids cooling. The tweeters, also sourced from SEAS, have 25mm coated soft-fabric domes, again have high linear excursion capability, and use compact neodymium motors so they can be mounted close to the midrange driver and each other. Distributing the treble signal across five tweeters naturally increases the treble power-handling dramatically, though part of this extra headroom is used up by opting for a relatively low crossover frequency of 1.5khz in actuality the front two tweeters only operate in parallel at the bottom end of their working range; although both come in at a nominal 1.5khz, as the frequency rises the upper tweeter is slowly rolled off, so that the overlap 'lobe' is directed progressively upwards, and output below the three spaced sources is somewhat suppressed. At the same time, the triple-tweeter array on the rear will tend to behave as a line source and concentrate its output in the horizontal plane, adding to the room-reflected treble output and helping to flatten out the overall far-field power response. First impressions are always useful, and with the Opera Grand callas these were mostly – though not entirely – favourable. The fundamental 'differentness' of the stereo imaging initially gave some cause for concern, but happily further acclimatisation after trying the speakers with a wide variety of material tended to accentuate the positive. One of this speaker's most notable strengths is its fine overall tonal balance and smooth even-handedness. It sounds pleasantly open without any aggressive tendencies, and no part of the frequency band seems exaggerated or out of place. 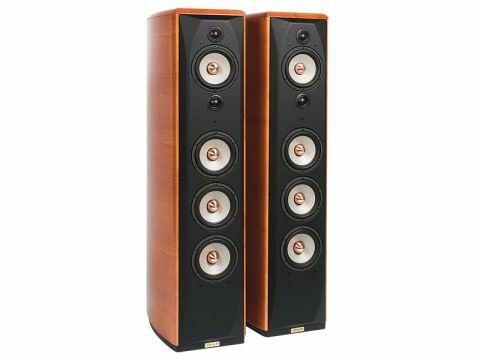 The in-room measurements do suggest that the top end might sound rather bright, but that's probably because the extra reflected high-frequency output, derived from the rear-mounted triple-tweeter array, shows up in the power response. Subjectively the top end is certainly obvious and perhaps a little strong (probably in part because the bass is on the dry side). It also lacks a little poise and precision perhaps, but crucially it never sounds unpleasant, maybe because of the extra headroom and freedom from strain that comes from using multiple tweeters. The bass end is smooth, even and well extended. It errs just a little on the dry side when the speaker is well clear of walls, but those who prefer a slightly richer character can easily remedy this by moving the speakers back a few centimetres at a time until the desired result is achieved. The speaker's dynamic performance is rather more mixed. it has a prodigious dynamic range, vindicating the considerable efforts that have gone into building a mechanically and acoustically 'dead' enclosure, but dynamic grip and expression somehow seem a bit matter-of-fact and muted. One might wish for a little more drama and excitement through the midband, though it's hard to explain why; perhaps it's a consequence of the rather laid-back image that seems to form itself a little behind the plane of the loudspeakers themselves. It's the imaging that really sets this speaker apart from the herd, and indeed this is the key feature that makes it a particularly interesting proposition. Changing over from a regular speaker with a conventional solitary high-quality tweeter, one is initially aware of some loss of focus and precision, and a shifting of perspectives. Although this seems somewhat disconcerting at first, after spending a little time resetting the radar and listening to various different types of music, the positive benefits start to emerge. The key question is how best to deal with the stereophonic illusion in the listening room. The purest form of stereo is the dummy head recording replayed through headphones, which can deliver an extraordinarily convincing surround soundfield from just two channels. But such recordings barely exist in practice. Although 'proper' coherent stereo material is sometimes found, the vast majority of recordings in the real world are artificial constructs, so precise accuracy at the reproduction stage is not necessarily of paramount importance. While the most precise imaging is delivered when room-reflected sound is minimised, many designers and listeners reckon that some addition of the listening-room acoustic gives a more natural result. Just how far one goes down the road towards full omnidirectionality (and hence maximum room-reflected sound) is a matter of debate and taste. Certainly the addition of room-reflected sound gives a better impression of the musicians performing in the room, adds extra air and spaciousness, and usually gives better results for those not sitting precisely in the stereo 'hot seat'. The Opera Grand Callas is particularly good at delivering the last two. The extra spaciousness seems particularly effective with choral and orchestral music, and when replaying movie soundtracks stereophonically, while the reduced 'hot spot' sensitivity also attracted favourable comment from off-axis listeners. Though not without its limitations, ultimately this is a speaker that goes a long way towards justifying opera's claim that it delivers a "more natural" listening-room experience.